Progressing towards more experimentation with mapping air, I have been testing the 3D scanner on some of these inflated and suspended objects. Ideally the object to be scanned should not be highly reflective or translucent. The golden ‘space blanket’ fails on both counts but the results were still useable. The initial scanning results, with a bit of mesh patching, can be seen below. The 3D model below is of the pictured object. The image is work in progress of an installation for an Open Studio to the public. 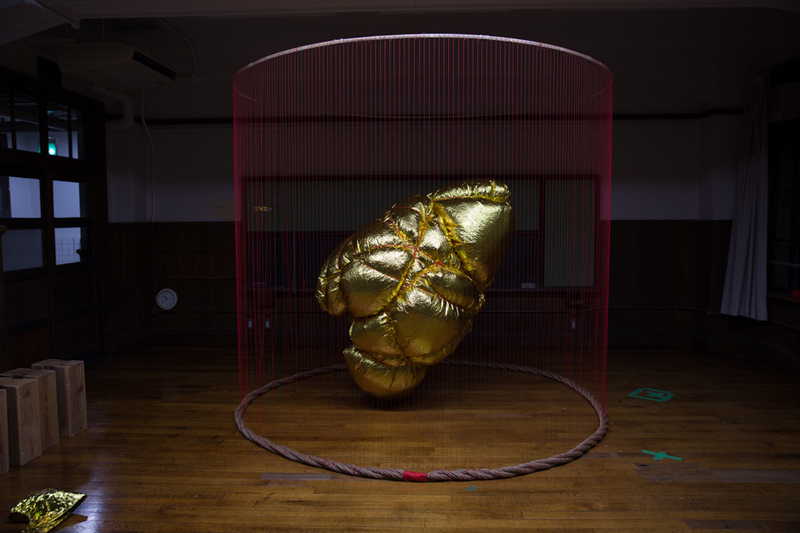 The installation included a projection of the rendered 3D model taken from the interior golden object. The video can be seen below. The video below is a rendering of the above scanned object. Referencing the ‘dry landscape’ gardens (karesansui 枯山水) found in many zen Buddhist temples throughout Japan. This was projected onto the windows of my second story studio space, and best viewed from the building’s exterior. At the time this work was being produced, the spaceprobe Rosetta was making a rendezvous with the comet 67P/Churyumov–Gerasimenko (67P) and along with its lander module Philae, was producing mapped images of the surface of the comet. These images of the comet, along with the stone garden at Ryōan-ji, Kyoto, work as inspiration for the work.